A Chevron gas station in Greenbrae, Calif., on May 2, 2014. 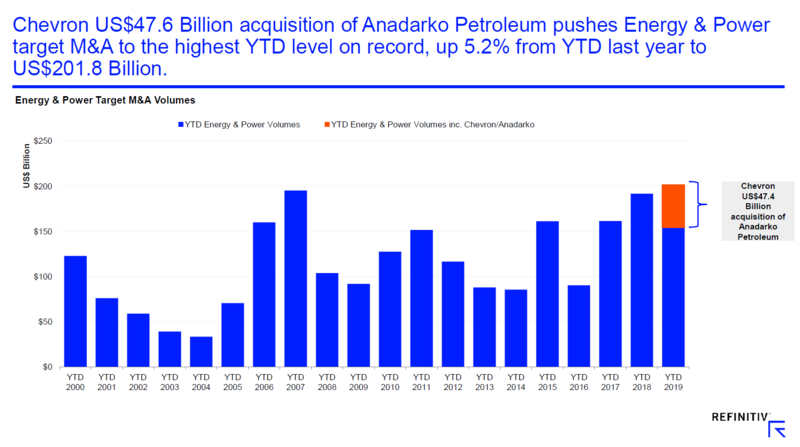 Chevron’s $33 billion acquisition of Anadarko sparked speculation the oil patch will see a new wave of consolidation as major players look to build scale and lower costs in the shale sector. Both Chevron and ExxonMobil are relative newcomers to the shale industry and both have made inroads into plays like the Permian Basin, where their heft has helped bring down costs. Kilduff said higher oil prices have made deals more attractive, but they’re not so high as to discourage buyers. “We’re in a medium price environment. If you look at the futures curve out to 2028, the forward curve can support these deals and these valuations,” he said. The price of West Texas Intermediate was at $64.50, up 1.5% Friday. Chevron has not been shy that it was seeking acquisitions. The company said in a release that it would look to upgrade its portfolio and potentially divest of $15 billion to $20 billion in assets between 2020 and 2022. The company said it expects the acquisition to be accretive to free cash flow and earnings one year after closing, with a $60 price for Brent, the international oil standard. Brent was at $71.75 per barrel Friday. Chevron will assume $15 billion in debt as part of the deal, which must be approved by shareholders. The company said that as a result of higher free cash flow, it plans to buy back more of its stock, increasing purchases to $5 billion from $4 billion per year. “You can imagine every banker in the world is calling these companies,” said one banker. He noted that potential targets just got more expensive, and it’s not clear that buyers will necessarily bite. Bankers have been expecting not only a wave of mergers among public names, but also among private shale plays. The U.S. has become the world’s largest oil producer because of the shale production boom. The U.S. produced 12.2 million barrels of oil a day in the past week, surpassing Russia and Saudi Arabia. The Permian Basin, producing nearly 4 million barrels a day, is expected to see production double in coming years, and this year it will see a boost from the opening of new pipelines in the second half of the year. Chevron shares fell 4%. Based on Anadarko’s closing price of $46.80 on Thursday, Anadarko shareholders will receive 0.3869 shares of Chevron and $16.25 in cash for each Anadarko share. Chevron will assume $15 billion of Anadarko’s debt. Correction: This story was revised to correct that the Thursday closing price of $46.80 was for Anadarko. Headlines also were revised to correct the spelling to Anadarko.